Productivity depends on creativity. A creative person will take time to be produced with unique things for you. Similarly, you can take time to become a productive blogger. Blogging is an art and a platform for creation. The creation should be reflected in your content. Importance of writing skill to become a good Blogger. Blogging is a tool, which can use to express views and ideas on the electronic platform. This platform will flash your content to read by everyone in the world. This is the best platform to use your free time for productivity. It is very common that words of expression hit on your mind. Blogging is the platform to save your words and share with the world. The flexibility of time is a plus point for you. 1. Fix Scheduled - Writing is the skill. You have to fix your schedule to write an effective and best post for your blog. Some people fill to do his work at night and some easy in the morning. So, this is upon you to select time as per your convenient. You should focus on the content and write useful content for visitors. So fix your schedule instantly for blog writing. 2. 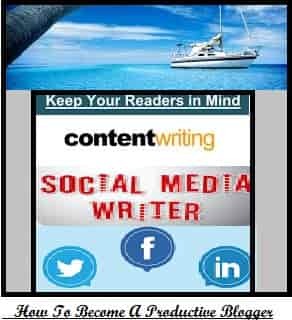 Continue Your Writing - Don’t stop to write valuable content. Sometimes you fade up to write. Relax for a moment and again start to think about the new topic. Writing is that skill, which needs everyday exercise. The more you write, the easier it becomes. Your writing skill will improve day by day. The new writer will face the pressure to write the content, which is grammatically correct. They afraid of mistakes, But they should be continued to write the content to make the writing easier for him, they should try to add the grammar in the right place. Don’t think very much to create the content, just start to write, which you are thinking in your mind. Ignore grammatical mistake and spelling during writing the post. Mistakes will reduce with time. 3. Don’t Distract - Focus on the content subject. Add relevant and valuable information. Peoples are distracting you by his comment on social media on the sharing of content. Don’t hyper on it and revert in a good manner with actual facts. Select the place, which is very good for writing and free from disturbance. Focus on writing creativity. 4. Create an Outline For Content - Create the outline for content writing. It should be well defined, what you want to write and what will be the subject?. The best way to break the article into categories. Your content should have subtopic and that reflects in one shot. Well defined description will be easiest to understand the main theme of content. You have to manage the main subject through highlights. 5. Research On Content - A valuable and analyzed content always likes by the readers. The value of content depends on the data, which share with others. A research-based content impact on the goals. Your focus to find out, which are the present trends. Which topic are more likes by the reader? Just check on Google Trends. Focus to use your writing skill in a smart way. Don’t make it harder for readers. Image research is also important. You will tag your image with relevant keywords and set the Alt Tag and Text for best definition. Your image adds caption option should be defined as the exact subject line. These tools are helping to make the blogger more effective and productive. Good writing skill is important to become a good blogger.